Lot Detail - Mills 10 Cent “The Bandit” with High Top Slot Machine. 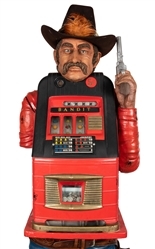 Mills 10 Cent “The Bandit” with High Top Slot Machine. Mills 10 Cent “The Bandit” with High Top Slot Machine. Chicago, ca. 1945. Height 68”. No lock and key. Working.